Aislinn is a teenage girl who can see faeries. She inherited this trait from her mother (who has died before the book begins) and her grandmother. Since she was a small girl she has been taught to live by 3 main rules. Rule #3 Don't stare at invisible faeries. Rule #2 Don't speak to invisible faeries. Rule #1 Don't ever attract their attention. Aislinn has successfully lived by these rules even though she can see that she is surrounded by faeries. Faeries that no one else can see. Faeries who tend to be cruel to mortals who have no idea they're even around. (Have you ever had a phantom type pain? or poke? or pinch? Could be a fairy!) Unfortunately for Aislinn, no matter how good a rule follower she's been, she suddenly becomes very interesting to two very powerful faeries. Keenan, the Summer King, believes that Aislinn is his missing Summer Queen. In order to save Summer... he must win Aislinn over and convince her to become his Queen. He has no idea that she knows all about the fairy... and therefore no idea how hard this task will be. Donia is the Winter Girl. She is one of the previous girls that Keenan thought was destined to be his Queen. She is just as interested in Aislinn since it's her job to try to warn girls away from Keenan. In the middle of it all, Aislinn is developing a relationship with Seth. Seth has been a good friend to Aislinn. Her best friend. He is her safe place. When she decides to confide in him about what is going on around her she finds her relationship with him growing. 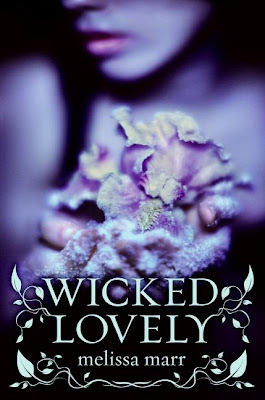 I found myself almost immediately interested and intrigued by all of the characters in Wicked Lovely (mortal and fairy). Marr has a way of making even the most outrageous of the fairy seem possible. She had me struggling with which characters were really good and which were bad... which I found made them even more real... more rounded out characters. The story was exciting and fast paced and VERY difficult to put down.